I only learned of Ian's passing when doing a bit of historical searching for my own past travels. I was indebted to Ian for leading me up Nelion back in 1994, not to mention the fact that he had established Howell's Hut atop thereof in previous years. He was a true gentleman and a wonderful guide, making it an enjoyable and not too challenging climb. I will always remember him fondly. RIP Ian. Ian is my inspiration for a forthcoming Alpine Club members trip to Mt Kenya in February., along with Andrew Wielochowski, who some of you will know well. Sarah his daughter has asked us to scatter his ashes near to his bivouac hut on Nelion. Near to where his heart is? Ian has also outlined some new route possibilities for our little team to attempt. I heard today that Ian had passed away....one of life's wonderful people, so driven and skillful. From 1977 - 1986 my then husband climbed regularly with him including an expedition to do a new route on Mt McKinlay. I always felt that he was in safe hands as Ian was brave and skillful but not foolhardy. It made being the wife waiting for them to come back so much easier! I was very sorry to learn yesterday of Ian's death a month ago. My first contact with him was in 1999, after I had submitted an article to the MCKJ about the climbing history of the little-known East Face of Mawenzi. Ian very kindly got in touch with me about it, & then (even more kindly) sent me photocopies of the articles in the EA Standard of July 1968 about his expedition there. He certainly didn't have to go to the trouble of doing all this, but the fact that he did spoke volumes about the sort of person he was. This expedition was probably one of Ian's more intrepid - & was certainly the one that most caught my imagination ! Its aim was to ascend the terrifying 7 mile long Great Barranco gorge (walls 2000+ ft sheer either side in the middle section, and its base only av 75 ft wide), & then climb the 5000 ft East Face from its head. Well, the expedition (which has never been repeated) was stopped half-way up the gorge by ever taller waterfalls & large pools of near-freezing water, but (more importantly) Ian (as its leader then aged only 32) got all his people in & out of this very dangerous place without mishap. 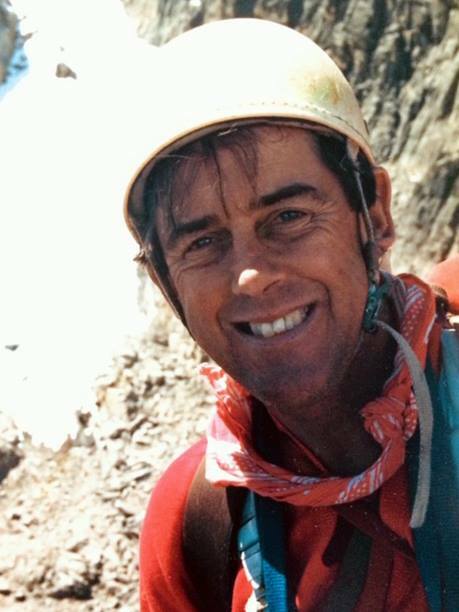 He & Roger Higgins as a substitute objective then made the first & only ascent of the East Face via the Middle Buttress between the two Barranco gorges. When showing me his slides of this climb in c 2001, Ian wryly mentioned the point where the Buttress narrowed to only 3 ft wide as it joined the East Face, with 3000 ft vertical drops either side ! Although we only actually met twice, he & I used to have regular lengthy phone calls about the EA mountains. He obviously knew Mt Kenya better than anyone alive, & was truly a worthy successor to Arthur Firmin at the very top level of EA climbers. The thing that struck me most, though, was his unfailing modesty, despite his many achievements - a true gentleman. My deepest sympathies to Ann & Sarah. Very sad news. I knew Ian as a fellow cub member of the then Harrow Mountaineering Club in the early 1960s. I was 18 at the time and just getting into climbing. I remember being slightly in awe of him because he was one of the most experienced and best climbers in the club, but he was easy going, very approachable and supportive. One of the nicest people in the club. I still have a copies of the menus for the club's 1962 and 1963 annual dinners which reminded me that he had served as a committee member, and had proposed a toast to the "Ladies and Guests" at the latter. I well remember the post card he sent to us from a trip to the Dolomites showing the Tres Cime de Laverado on which he had marked a dotted line up the face of the Cime Grande with the simple comment. "Did this yesterday"
I had the great good fortune to spend 7 years in Kenya and the best memories of that time seem to revolve around the Mountain Club and climbing. Ian welcomed you to the club and climbing in a way that challenged you to explore and enjoy the crags. Strategizing wins at the annual MCK Dash, putting up new climbs or exchanging stories over beers at the club house, Ian kept a warm yet competitive atmosphere alive at the club. He leaves a legacy of amazing ascents and good memories. I returned to Kenya (where I had been at school in the 1960s) from 1986-1991, and shortly after arriving I met Ian at the Mountain Club. For the next five years I climbed regularly with Ian, who put up with my humble level of climbing talent (or lack thereof), and mentoring me in the most gentle of ways. I treasure the memories of those days in Kenya, taking his daughter Sarah and my son Robin up Jacob's ladder, slogging across the vertical bog in a downpour, and drinking a beer at the campfire. Raymonde and I send our love to Ann and Sarah. I first became aware of Ian Howell through my father, Roderick Snell. Before Ian moved to Kenya he worked at the BBC in London and would make climbing forays to the sea cliffs of South West England and the mountain crags of Wales. Lacking regular climbing partners, Ian persuaded my dad to join him and so began for my family a love affair with mountains, thanks to Ian. Years later as a teenager I developed my own passion for climbing and heard stories of Ian's exploits from my father. Together they climbed new routes in Swanage, Pembroke and I think in Snowdonia. Later I met Ian in Bradford-on-Avon and attended a talk he gave at the Alpine Club in the UK. Like so many others here I was struck by his jolly, unassuming, humble nature, masking an extraordinary array of climbing achievements. I and my family send our gratitude to Ian for giving us a love of climbing and our sincere condolences to Ann and Sarah. I did not know Ian very well despite meeting him in Kenya and then later at MCK reunions in the UK . He was a gentleman in all senses of the word, he had a lovely smile and his actions (especially climbing ones) spoke louder than words. Camber and I send our condolences to Ann and his family. Ian Howell’s, mountaineering and rock climbing accomplishments in Kenya are legendary. He excelled in resolve and determination. His personality amiable and good natured. A modest man, yet a person of magnitude. No defined words can do Ian justice. I first met Ian Howell on Mt Kenya with Iain Allan in 1979, they had just finished a new route. Over the years, Ian and I climbed together in different settings, from Kenya to the USA. Treasured moments, which will remain indelible. I first met Ian in 1968 on my return to Kenya and as I started to climb with the group that formed around Ian my Nairobi house soon became Pin's week-end pad if he was not on The Mountain or exploring around Isiolo.. And so like many others I formed a lifelong friendship with one of the best climbers I climbed with, as well as on of the nicest men I shared many a post climbing beer with. I also felt that with him I climbed at my best, and it was not just the occasional tight rope. to help him into his rockboots. Of course he then proceeded to climb with his usual skill. Pin, many will miss you. And who now holds your old record for patching a punctured innertube and getting back on the road? Ah, Ian Howell: now there is a legend. I found him something of a puzzle. Most climbers, after all, look like climbers: muscly and squat, or lithe and agile, or tall and rangy etc. But Ian always had the look of a semi-retired accountant, or an unemployed librarian, with his slight frame usually draped in old sweaters, rumpled trousers, thick glasses and straggly hair. You wouldn't guess the magnificent climber underneath. But I knew the reputation, and like so many others before and since, I was simply grateful for his friendly welcome and ever-ready advice. And the climbing! I remember on a trip up to the Ndotos, stopping by Ololokwe to have a go at a climb on Cat and Mouse. We aimed for Mouse. From a distance it looks hardly significant, a mere speck alongside the crouching Cat. But close up, it is a 120-ft vertical pinnacle of dreadful loose rock. Ian had told us there was a route he had put up there, with old pegs. Too right they were old; and, even worse, of that variety that look like twisted tent pegs. Ian claimed to have put them in on lead. When I saw them, I thought he must be mad, or lying. The rock was gradually exfoliating, with huge boiler plates ready to come loose. It was terrifying. I was equally scared of falling off myself, or pulling down some giant plate on to the heads of my trusting companions Bill, Jess and Kathleen. There was no natural pro, and I was desperate. Arriving at each peg was a grateful clip and rest. For Ian to have put them in from the ground up, as he claimed, he must have been standing on top of one peg and wielding a drill above his head to put in the next. I thought he must be a fantasist, at best. I still think so! But it is a mark of the man that he put up so many hundreds of wonderful routes that he will not be remembered for this nothing climb on scrappy rock, on Mouse. Except by me. For me too, he was always the welcoming jinni of the MCK club-house: how appropriate that he lived there, alongside all the gear and the memories, maintaining the building and offering free advice to anyone who needed it. Truly a generous spirit. Much missed. Ian was so modest about his achievements and always ready to help youngsters and newcomers. Some of his early bush climbs are really under-graded and difficult to repeat as Andrew W and I discovered! Talking about Andrew- he mentioned below our Tsavo expeditions (in the early 1980's ) but diplomatically missed out the one trip where Ian's safety precautions proved justified as I rolled the car just a few miles short of the Tsavo river campsite- we managed to get it going, albeit with smashed windscreen and buckled front pillar and drove into camp to Andrews comment: " You do roll into campsite in style!" Some other funny stories about Ian- like when he was sitting with a bunch of us around a Lukenya BBQ campfire and after a few Tuskers we saw him keel over head-first into the fire, head-torch and all! We quickly pulled him up- no injuries! And another time he needed to uproot a tree stump from his compound and decided on a short-cut of using an old climbing rope and pulling it with his Subaru- it worked, but also shot out like a missile and dented the back of his car! There are so many other memories...from MCK committee meetings, to his pyjamas and bedroom slippers during MCK supper nights, to the time we were summoned at very short notice to the State House together with our Patron Ken Matiba to meet the President as part of the Everest Kenya Expedition preparations. Those were the days! Rest in Peace my friend, and heartfelt condolences to Ann, Sarah, and other family members and friends. Polly and I were very sad to hear of Ian's passing this week. I am very proud to have known him, climbed with him, and to have been his friend. He is probably the most inspiring climber I have had the privilege to know. I have many memories of him at Lukenya, Frog, at the club in Wilson airport and treating him to dinner at our house in Nairobi. For some reason I have many very clear memories of my times with him. I was only in Kenya for a few years but was able to do many of his routes on the crags and on Mt Kenya, he had a great eye for a line. In my last six months it was Ian that inspired me to go exploring and try and put up some new routes, none to match his but satisfying none-the-less. He taught me to climb hard whenever I could and save the easy routes till I was older and less able. I was pleased to be able to help maintain his mountain top hut and still have the rucksack stained with glue that spilt while climbing up with insulation to repair his hut. We exchanged Christmas cards when we returned to the UK and he always put me to shame with news of all the adventures he was still having while I was looking after my kids and not getting out as much as I should. He will stay in my memory for a long time. I am sorry I can not attend his funeral. It is with great sadness to hear of Ian's passing. Condolences to all his family. We went on a number of MCK trips together with Ian and fondly remember his company and the stories of his adventures and still wonder at his amazing achievements in and around Kenya (and further afield to Malawi). We also remember Ian for his contributions to the Tuesday dinner + slide show nights, where he would bring roast veggies and potatoes, without fail. May he rest in peace. Many years ago, I was lucky enough to find myself on the Normal Route on Nelion with Ian and two other climbers. Not far below the summit, at the point where one bears right to avoid that steep final wall, it began to sleet. The rock grew cold, the fingertips lost feeling and before we could put on outer garments, we were wet and miserable. At the belay, we paused to consult. We were not far from the summit and on top was the shelter Ian himself had built, in his extraordinary feat of climbing altruism. But I trusted Ian's mountain judgement, against which my own experience was insignificant. We could make it to the top, he suggested, but four wet and cold climbers would likely have an uncomfortable night and still have to descend the mountain, stiff and damp, the next morning. If we went down now, on the other hand, we still had enough daylight to get to the bottom of the wall and across to the Top Hut, before it was dark. And so we went down those long abseils and across to Top Hut, changed our clothes, warmed up and ate whatever treats we had brought, of which the main ones emerged from Ian's always well-stocked rucksack. Whether high on Mt. Kenya or high on some overhanging bolted horror at Frog, Ian was a pleasure to climb with. Safe, modest and engaged, he enjoyed every move he made and made sure that those who climbed with him did too. Friend, mentor, all round mountaineer, gentleman - the world is the poorer for his passing. I was shocked and upset to receive news of Ian’s passing yesterday.. I was posted to Meru in 1966 as an agricultural officer when Ian was working in the then NFD in the police signals dept. I and friends got to know him well. Some 45 years later I was so pleased to run into him again at Africon meetings in Bradford on Avon where he actually lived, the other side of Bath to myself.. We were able to recall memories of those days and met at meetings several times since. I was expecting to meet him at the last Africon meeting in a week’s time (it is being wound up as old age catches up with it’s membership). Sadly not to be, but I shall remember Ian as a gentleman - modest, unassuming and with a great sense of humour. RIP Ian. Remember the first time I met Ian in 1991 at the Clubhouse. Graciously introduced us to the MCK and the wall. He was always ready to help others. Had the honor to hike up Mt Kenya with him in the late 90's and of course climb with him at his 3 string quartet farewell party at Lukenya. He was a Honorary Life member and a Trustee. I came to know Ian Howell through my late dad Kisoi Munyao and later when I was introduced to MCK.I never interacted with him at a personal level but his works in mountaineering speak loud.I believe the history of Mck and mountaineering in Kenya is incomplete without the name of this great man.I am a beneficiary of his works having slept at the Howell s bivi on top of Nelion which he built. I have named my boy after him,he is truly a great man may his soul rest in peace.